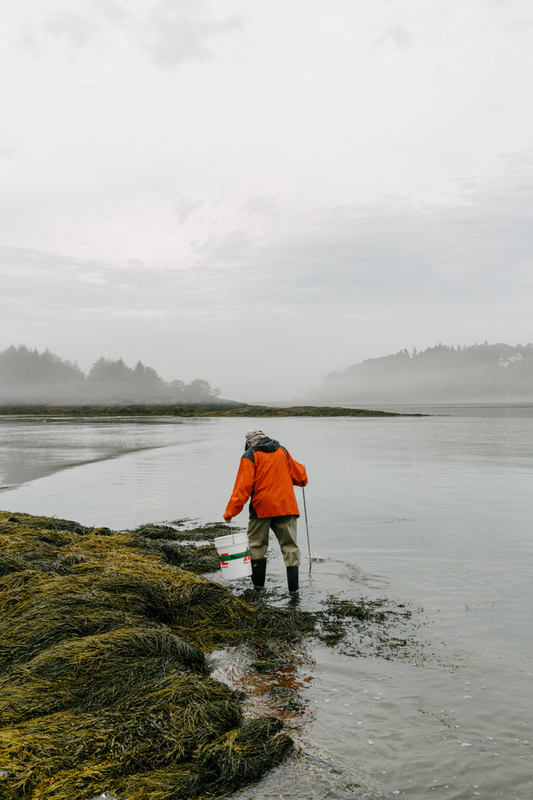 John Holt slowly makes his way across the tidal flats to the Heal Eddy Restoration Project, a commercial, softshell clam farm, in the mud flats behind his property in Georgetown, Maine. The Heal Eddy Restoration Project is the only commercial-scale softshell clam farm in Maine. Through a grant from National Oceanic Atmospheric Administration (NOAA), a partnership between experienced shellfish harvesters, riparian land owners and scientists at Manomet, a New England-based organization that promotes environmentally sustainable economic endeavors, the Heal Eddy Restoration Project will serve as a model for other coastal Maine communities to adopt in hopes of saving the clamming industry, which is disappearing as the Gulf of Maine waters continue to warm and predators, such as the invasive green crab, multiply and decimate the wild clam population. It takes three things for the softshell clam farm to be successful, says riparian landowner, John Holt: "Fire in the belly, skin in the game and a sense of delayed reward."